(Aleurotuba jelinekii, Aleyrodes proletella, Trialeurodes vaporariorum) Whitefly, as their name suggests, are small white flies that attack a wide range of plants. These sap-sucking insects can build up in large numbers and weaken plants. Whitefly are small, sap-sucking insects that attack a wide range of greenhouse and indoor plants, brassicas (broccoli, Brussels sprouts, cabbages, calabrese, cauliflowers and kale), Viburnum tinus and the strawberry tree Arbutus. They have a yellow body and white wings and measure 1-2mm (1/16in) long. Whitefly breed very quickly in summer and produce such large numbers, that clouds of them erupt and fly off the plant when disturbed or the plant is brushed past or moved. The adult whitefly lay pale yellow or grey eggs either individually or in circles on the undersides of leaves. These hatch into tiny larvae, which look like pale yellow or translucent, flat, scales that can move around at first and then become immobile. There are three main types of whitefly. The commonest are greenhouse whitefly (Trialeurodes vaporariorum), cabbage whitefly (Aleyrodes proletella) and viburnum whitefly (Aleurotuba jelinekii). Being sap suckers, whitefly extract sap from the plant when feeding on them, using their piercing mouthparts. Large infestations can weaken small and young plants or even kill them. Even quite small infestations can cause reduced or stunted growth. Large well-established plants are rarely severely damaged, but the plant parts they are feeding on can become stunted or distorted. Whitefly can also transmit plant virus diseases in their saliva, resulting in plants that then succumb to the virus disease. Such plants should be destroyed, as there is no cure for plant viruses and to prevent the disease spreading to other plants. As they feed, whitefly excrete a sugary, sticky substance, known as honeydew, which drops on to the leaves below where they’re feeding. This not only makes the leaves sticky, but the sugar attracts sooty mould, which can cover the whole leaf with a black deposit that reduces or prevents light reaching the leaf and so reducing the plant’s overall vigour further. Ants feed on honeydew, so signs of ant activity may be a symptom of whitefly attack. Whitefly breed very quickly – each female can lay more than 200 eggs – completing their lifecycle in around three weeks in summer. Once numbers build up, control becomes more difficult. So, it is important to check plants regularly, going out on Pest Patrols, and dealing with any you see – as soon as you see them. You can control a small numbers of whitefly by either squashing them or taking off and destroying the plant parts where they are congregating and feeding. Although, due to their habit of flying away, some of the adults may be missed, but this will control the eggs and the scales. In greenhouses and indoors, hang yellow sticky traps just above or among your plants to trap the adults. You can even hang them among brassica plants. Whitefly also feed and breed on numerous weeds, so control weeds inside and around greenhouses, and outdoors near where susceptible plants are growing. In the greenhouse, whitefly are best controlled using the biological control. Encarsia is a small parasitic wasp that lays its eggs in the scales, where its larvae develop and kill the scale. Some people even vacuum them up using portable, battery-operated vacuum cleaners! There are numerous chemical insecticides available that will kill soft-bodied insect pests, such as whitefly. The majority of these are what are known as “contact” insecticides. That is, you have to spray the actual insect (make contact with it) to kill it. If you miss some, or others land on the plant after spraying, these will not be affected and will carry on feeding, breeding and building up whitefly numbers. Also, most are based on “organic” or “naturally-occurring” materials and have very little persistence once sprayed on to the plant. This means you have to spray regularly – which could be as often as every couple of days in a warm summer – to stand any chance of controlling them. Some whitefly strains have developed resistance to some insecticides, making them ineffective. A systemic insecticide which also kills on contact – is absorbed by the leaves and moves all around inside the plant, so will control future attacks from insect pests, for up to two months. BugClear Ultra Vine Weevil Killer is a compost drench, watered onto the compost in pots growing ornamental plants. It is absorbed by the roots and then circulates all around inside the plant. “Plant Invigorator” products, can also give excellent results. These are not pesticides per se, but plant growth stimulants that also control pests by physical methods. They can be used on edible crops. Check the undersides of leaves of new plants for signs of whitefly, to prevent introducing them in the first place. You can protect plants from attack by covering them with a physical barrier – such as horticultural fleece. 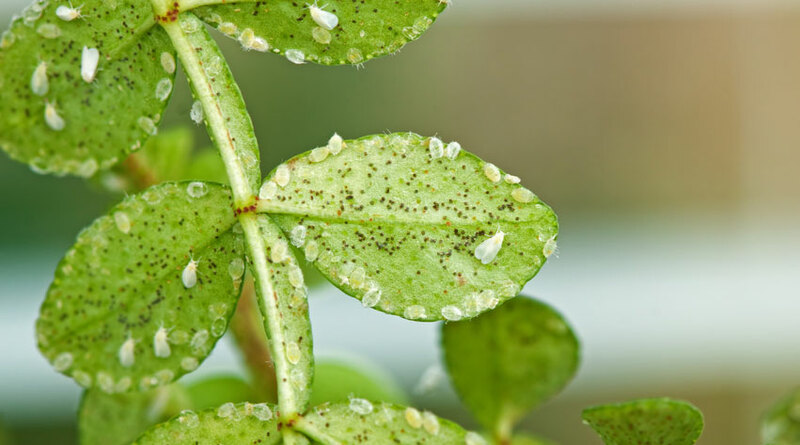 Just bear in mind that plants must be pest-free before covering – otherwise you’re providing a protected environment for them to carry on feeding and breeding – and, as whitefly are small, they can easily get through any breaks in the barrier. This method is really only practical for brassicas.